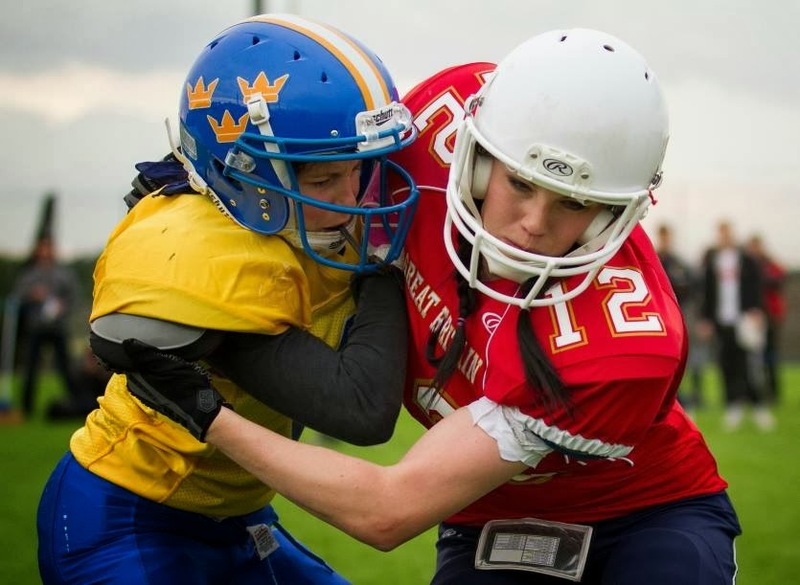 In a locker room full with nerves, excitement, pride and plenty of red, white and blue, 18 women were preparing themselves for the first ever game for the Great Britain Women’s American Football team. 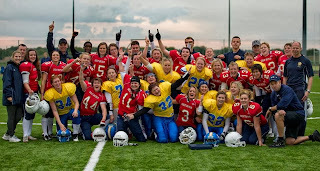 The game was played after a summer of hard work by the British American Football Association Women’s Football Development Group who bought together new and old players from all over the country and develop their skills and give them an opportunity to try out for Team GB by hosting Development Days. The team was made up of 11 women who had never played football before the summer and seven who had previously played for teams the University of Southampton Stags, the University of Hertfordshire Tornadoes and the Royal Holloway University of London Bears. Great Britain’s Head Coach Jim Messenger named Amanda Casey, Beverley Marwood and Robyn Stewart as Team Captains for the day who took to the field for the coin-toss, which was won by Sweden. As Sweden’s offense lined up, Great Britain’s defense showed determination, denying Sweden a new set of downs and turning the ball over to the Great Britain offense. Great Britain started rookie QB Jo Kilby who swiftly showed her skills by shaking off the Sweden defense and making a completion to Laura Hill for a first down. With a new set of downs, Kilby threw a long pass to the endzone, caught by Lauren Hackney for the first points of the game and Great Britain’s first ever touchdown. An extra point was added by a completion from Kilby to Robyn Steward making the score 7-0 to Great Britain. Less than five minutes later, Sweden responded with a strong offensive drive that landed them in the endzone after a run from Sofia Beckman. The PAT was no good, meaning Great Britain were leading 7-6. After a both teams failed to convert their downs and the first snap of Great Britain’s next offensive drive resulted in a Safety for Sweden, giving them an 8-7 lead. Both teams were failing convert once more and the clock had run down to the two-minute warning on the half when Great Britain’s defensive captain, Beverley Marwood made a huge defensive play, intercepting a vital Swedish pass. Great Britain’s offense couldn’t advance but with the Swedish offense back on the field, a mis-judged play resulted in a safety and two further points for Great Britain, giving them a 9-8 lead when the half-time whistle blew. During half-time, Dr. Elesa Zehndorfer, head of Women’s Football for BAFA, signed an agreement with the International Working Group on Women and Sport (IWG) called ‘From Brighton to Helsinki’ ensuring further support and sponsorship for women’s sport worldwide. For the signing, Zehndorfer was joined by Great Britain’s Head Coach Jim Messenger and captain Beverley Marwood and Sweden’s Head Coach Johan Sedin and captain Frida Lööv. With a just a point between the scores, the energy around the field was building as nerves kicked in for those on and off the field. Sweden’s offense kicked off the second half on their own five yard line but failed to convert on fourth down, handing the ball to the Great Britain’s offense. A mere four minutes later and Robyn Steward ran her way into the endzone once more and added another six points for Great Britain. The PAT was no good but Great Britain were now leading 15-8. The ball was turned over once more as Sweden failed to refresh their downs and the Great Britain offense was back on the field. A powerful run from Nancy stone refreshed the downs, soon after Chloe Baton threw to Becky Williams for Great Britain’s third touchdown. The PAT was no good but Great Britain were up 21-8. On Great Britain’s next offensive drive, a bad snap resulted in a safety for Sweden, giving them two more points and bringing the score closer to 21-10. A couple of turnovers later Great Britain’s Laura Moore refreshed their downs and the two-minute warning came seconds later. 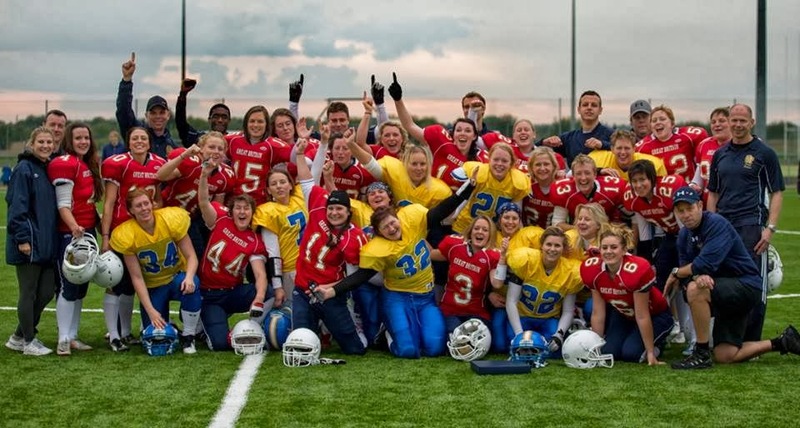 Just when everyone assumed that Great Britain would be running the clock down to end the game, Becky Williams broke through Sweden’s defense for her second touchdown of the game and increasing Great Britain’s lead to 27-10. The PAT was no good but it was clear the Great Britain had their first game in the bag. As Sweden’s offense came on the field determined to gain more points, Amanda Casey intercepted a pass, bringing the Great Britain offense back on and thus ending the game. The Great Britain sideline erupted with joy and after some quick hand-shakes and hugs, the MVP trophies were handed out to Sweden’s Sofia Beckman and Great Britain’s Amanda Casey. Beverley Marwood and Jim Messenger were presented the trophy for the game by Elesa Zehndorfer. The outcome of the game was a true testament to the hard work that the players and coaches put in and Sweden were the perfect opponents for the game, bringing out the best of the Great Britain women. 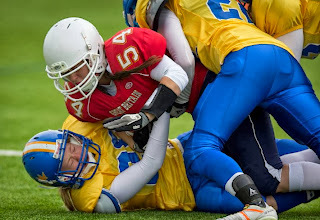 Visit womensamericanfootball.com for more information, game stats, photos and more!